We went strawberry picking last week and I realized that I needed to do something with the strawberries I did not freeze. They were sitting in the fridge and I worried about them getting too soft. I've always made strawberry pies, jams or shortcakes but I really wanted to try something I never made before. I remembered a wonderful dessert I had at a restaurant during winter called Schaum torte. I've never had it until that day but my husband just raved about how his grandma used to make it for their Sunday dinners during his childhood. How lucky. I found a recipe online for Pavlova. It looked exactly the same as the Schaum torte I had eaten except that the Schaum torte was piped into a nest shape and the Pavlova was just dolloped into its shape but flattened out in the middle to look like a nest. I had to give it a try. As you can see from the photo, it was a great success. I had to make a strawberry topping that was similar to pie filling bit a little thinner. Freshly whipped cream was the perfect addition to make it exactly as in the restaurant. All I have to say is that this recipe is a keeper. And it wasn't terribly complicated, in fact, I had all the ingredients at hand - no special trips to the grocery store! Today I quilted two quilts for a client. It's been raining a misty annoying rain on and off all day so it's a good day to be inside. Normally being inside on a summer day is not something I like to do. Warm weather season in Wisconsin is short so I try to enjoy every moment of it. At least being indoors has made me productive in my sewing room. I quilted 18 table runners over this past week. I've been using up all my food-related novelty fabrics to make these. Hopefully I can get the binding on all of them before my long arm gets delivered. I'm pretty sure that once the long arm comes I'm going to forget all about sewing for a while. I sold my Rose today to a nice woman, MaryJo who's friend told her it was a great machine. I agree, it is a great machine. I hope MaryJo gets as many years of pleasure sewing on her as I had. She is a work horse and a wonderful machine. I did it! I bought a longarmer today. I still can't believe it. It's a dream come true. 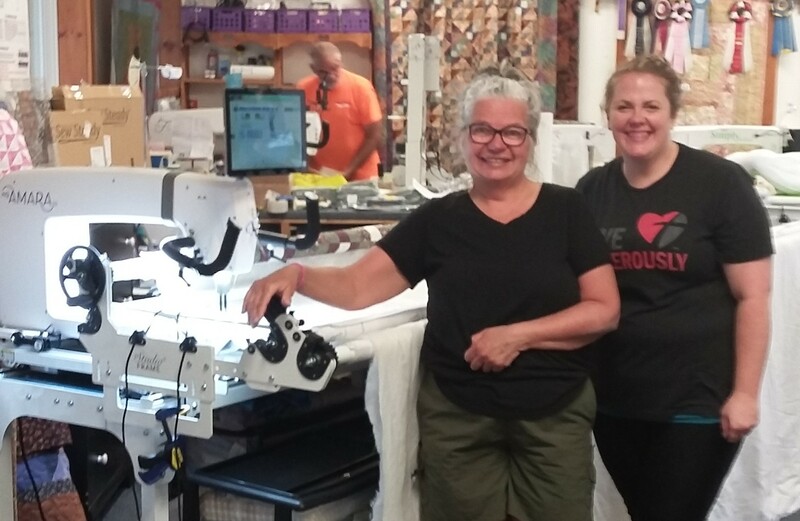 The shop that I purchased it from is called The Quilting Connection and it is located in Elkhorn, WI. It's a 45 minute drive from my house and because they do many quilt shows and spend time setting up machines, their shop is by appointment only. I called first thing this morning hoping to get in early in the day but they were out setting up a machine. They called and stated that they would be back in the shop by 3:30 and I could come then. At the time of their return call I was babysitting my granddaughter and we were swimming. I still said yes I would come today even though I felt covered in chlorine-laden pool water. The hair just frizzes up under those conditions. I got to the shop at 3:50 and left with a signed contract at 5:05. Wow! What an afternoon. So now I await confirmation that the machine is being built and sent to the shop for setup. Then they will contact me to pick a delivery date to my house. My sewing room is ready and I can't wait! I finally hand-stitched the binding on this quilt. I completed the quilt top over a year ago and until recently, I hadn't found the time to quilt it. I even had the backing pieced together for a very long time. The quilting went quickly; I used variegated thread to compliment the colors in the fabrics. I used a meander to quilt it. Then I sewed the binding on and again, I let the quilt sit. All I needed to do was turn the binding over and hand-stitch it down and it seemed that once gardening season came, I just could not find the time. It's been raining and chilly outside the last few days and that gave me a moment to get the hand-sewing part completed.